The above question probably isn’t one you’ve spent the summer pondering, but indulge me here…if the fixtures were colour-coded by difficulty, what would we be presented with? The answer is the season visualiser, devised by the brains over at Experimental 3-6-1. The theory is simple: each game is illustrated by a colour – anywhere between a strong green and a deep red, with every shade of yellow in between. This means a quick scan of the fixture list can identify potential tricky spells, as well as periods where the team can aim to capitalise on supposedly easier matches. (1) is weighted more highly than (2), so there’s no way that, say, Crewe racking up almost 70% of their points tally from home matches last season will cause the algorithm to conclude that facing Crawley at home is easier than a trip to Macclesfield. The greenest fixtures represent the (theoretically) easiest and their reddest the hardest, relative to other games. Yellow is the midpoint of the colour range, so fixtures of this hue are of relatively average difficulty for the team. Of course, this is not an exact science – how easy or difficult a particular fixture is could be debated ad infinitum, but using primarily the bookmakers’ odds is as objective a view as one can hope for. Over at Experimental 3-6-1 they have compiled the season visualiser for every team in the Football League, but below you can see the data for just Blackpool’s 2011/12 fixtures. At the green end of the scale, the season visualiser highlights the home games against Doncaster and Barnsley as the most winnable fixtures, while at the opposite end of the spectrum, the two fixtures with the deepest shade of red are the trips to West Ham and Leicester. These are all fair assumptions, the two South Yorkshire sides look set for a tough season battling relegation, while big-spending Leicester and Allardyce’s Hammers are most people’s favourites for automatic promotion. The above graphic offers the opportunity to see where runs of green should offer the ability to rack up the points, whereas the bunched red and orange colours pinpoint potentially trickier times. However, this is a lot of information to take in at once. What if we were to break the season visualiser down into month segments? What shape would the season begin to take then? 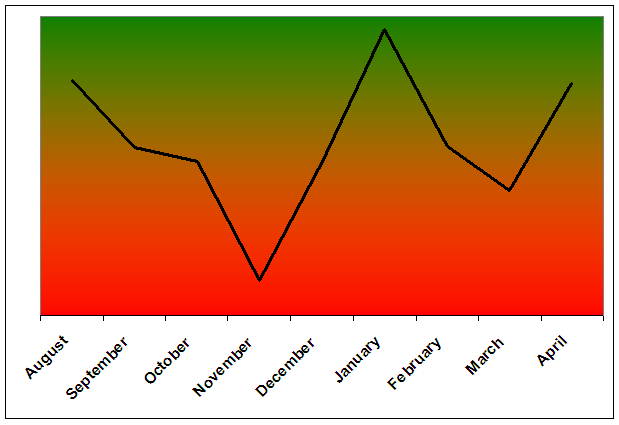 By taking a monthly average of the values pertaining to each fixture, the chart above has assigned a colour to each month – once again with red indicating the potentially most difficult month, and strong green illustrating the theoretically easiest month. This perhaps offers a more telling insight into our season, and particularly highlights how important a good start could be. A failure to take early points in August, one of our more straight-forward months fixture-wise, could mean we will spend the season forever playing catch-up. An upturn in difficulty looks set to coincide with the clocks going back in October, and we could be headed for a dark autumn / early winter if we start slowly. January appears to be the kindest month according to the season visualiser, so it’s to be hoped ‘Pool do not suffer a New Year hangover at a time when points could be there for the taking. The final month of the season also provides decent point-scoring opportunities, but games against Forest, Leeds, Burnley and Millwall to finish the season will hardly be easy pickings. Note: the colours on the graph do not provide an exact match to those from the monthly visualiser, but do give an indication of how this can be viewed in terms of peaks and troughs. Moving away from the abstract colours and graphs, what can we pull out of this data in terms of targets? Using the numbers behind the colours, we can form a weighted table for points targets at the end of each month. The table below takes into consideration the supposed relative difficulty of each fixture and offers a points target that Blackpool should be looking to hit, based on one of three end of season outcomes: survival, a play-off place or automatic promotion. The targets have been set at the generally accepted average points totals required for each of the three landmarks. For example, to be on course for a play-off place at the end of December, ‘Pool should be aiming to have accumulated 38 points. Based on the information yielded from the season visualiser, what should be looking at? At what points in the season is it important for Blackpool to perform? How much stock you put into all this depends on your view of the bookmakers’ odds. The old saying goes that you’ll never meet a poor bookie so the way the teams have been ranked probably isn’t far off the mark, but this has all been calculated before all squads have been assembled, so no doubt there will be some fluctuations in odds even just a month into the season. It will be fascinating to see if reality matches up to the science though, and I’ll be following up on this theory on a regular basis throughout the course of the season. Will our form match up to the graph? Will November be as difficult a month as the visualiser suggests? I can’t wait to find out when the season gets underway. Credits: Thanks must go to @GreenwichGull, the man behind Experimental 3-6-1 for his assistance, in not only inspiring the idea for this article with his original post, but also providing the data which allowed me to create the various charts and graphs. E-3-6-1 is a highly recommended read, so why not head over there and see what else is on offer? « A new season, a new home for Tangerine Dreaming…..